Hanuman, Our Lives and the Annual Sportsmeet - part 03 - Life is a Challenge; Meet it! SG: Absolutely. In order to pass the test you need tremendous courage. Swami always says that Hanuman is the epitome of courage. 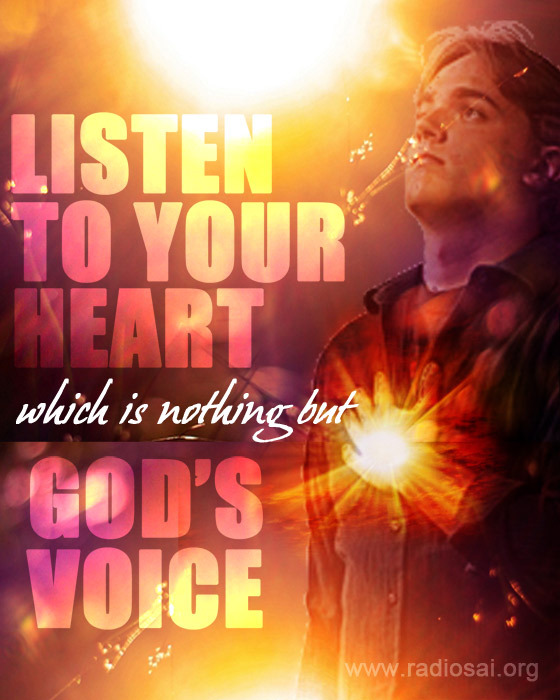 Here we are not talking about ordinary daredevilry but a courage born out of deep and unshakable faith in his Lord. That is the kind of courage which Hanuman demonstrated. Bishu, you mentioned about the first challenge which Hanuman encountered — that of the Mynaka Parvat or the mountain Mynaka. This is described as a satwic challenge. When this favour was offered to Hanuman, he did not categorically refuse but negotiated it well – he spoke to the mountain politely, touched it gently and moved on once it was happy. The lesson here for any sadhaka or any devotee of the Lord engaged in the Lord's work is that whenever such satwic obstacles come, the best way to overcome them is negotiation. BP: You may not always oblige but you can speak obligingly, as Swami says. SG: At times, you have people who are actually well-wishers but even what they say or do might be obstacles in our service to the Lord. What we should do then is speak obligingly and lovingly, without hurting them, but ensure that our focus on the Lord's work does not waver even for a moment. SG: That is the characteristic of a devotee who is engaged in the seva of the Lord, he or she becomes a natural inspiration to the people around. 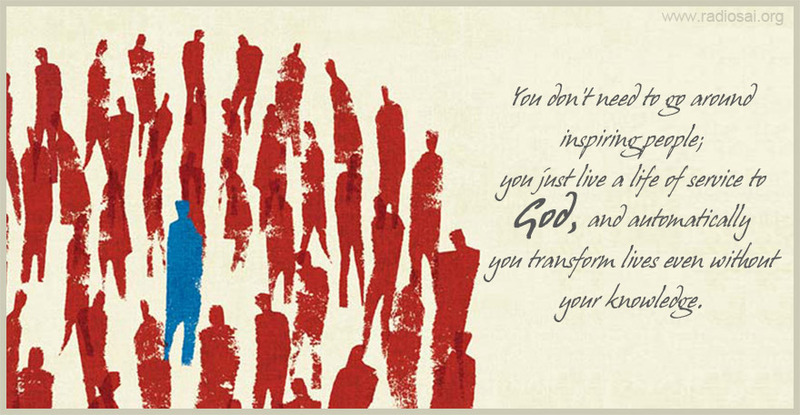 You don't need to go around inspiring people; you just live a life of service to God, and automatically you transform lives even without your knowledge. BP: Just like a flower. The presence of the flower means there is fragrance around. SG: Beautiful! The second obstacle Hanuman faces is a serpent demoness by name Surasa. She had a boon from Lord Brahma that whoever passes that area has to become her food — that being has to enter her mouth and come out. Hanuman passes by and she tells him about her boon. She was so pleased with him that she said, “My dear son, this was indeed a test for you and I am very happy with you. I bless that whatever endeavour you are going for will definitely be successful.” This second obstacle is described as the rajasic obstacle. To extrapolate this, we have issues which we face in society. There are some social norms which are against the principles of seva or the principles that the Lord has taught us. How do we deal with these? These are the rajasic challenges. They apparently look okay for the society but in the path of God it is absolutely blasphemous. BP: There are many instances of our students going into the corporate world and being asked to do things saying, “This is the norm of the company” or “This is what the boss wants”, etc. At times, they are in tricky situations. Deepak Anand, have any management alumni shared such instances with you? DA: One instance which comes to my mind is regarding one of our old students from the MBA department, Mr. T. N. Giridhar. He was supposed to go to London and make a presentation on behalf of his company for a big contract worth millions of dollars. Being his first such big assignment, he was very nervous. Sitting outside the boardroom where he had to go and make the presentation, he was tensed and his hands were sweating. Suddenly, he remembered something Bhagawan had told him. Many years ago, there was this practice of flute being played for 15 minutes before bhajans start in the evening. One such day he was sitting in the portico and Swami was there talking to him. Sitting outside the boardroom the moment he remembered this particular instance he immediately overcame all his tensions and dilemmas, because he understood that he had to only go there as a speaker but the music will come from God within. SG: I remember the experience of a very senior devotee of Bhagawan. He was appointed as the head of one of the most prestigious organisations at the national level which controls industrial policies, etc. As part of the ceremony of being appointed as the chairman of that committee, it is mandatory to raise a toast; this means you should have wine with your colleagues. Here was a devotee of Bhagawan who follows Swami's teachings implicitly. He absolutely avoids drinking and smoking in his life. He was wondering what to do because here was a glass of wine and it was a mandatory ritual which he cannot negotiate, like how Hanuman negotiated with Mynaka. It's a rajasic obstacle. But Hanuman teaches a beautiful method here — “Use your intelligence or yukti (intelligence).” In fact, this yukti is not ordinary intelligence but is intelligence inspired by your conscience or in Hanuman's case specifically the Atma Rama. Here is what the devotee did. He connected to Bhagawan within and an intelligent method flashed in his mind. There were a few flower pots along the side of the room. As he went to each of his colleagues, he would clink the glass, raise the toast, and slowly pour a bit of the wine into the pot, unnoticed by anybody. By the time he completed his circle, everybody noticed that his glass was empty. They thought he had participated in the ritual. But the fact remains that he was holding on to the principles that Swami has taught, even at that level where he was the Chairman of such a prestigious organisation. This yukti is born out of the connection or the understanding that the Lord is the actual doer. When we talk about yukti, they say, “How do we get such intelligent methods?” They say this person was lucky to have got that kind of an intuition at that point of time. But the fact remains that if you are keen about serving the Lord and if you have dedicated yourself to the principles that Bhagawan has taught you, He Himself will come and protect you. He will give you the right kind of intelligence to overcome that rajasic obstacle. He never came for bhajans and I never went to the club; that was the first part. The second part was that whenever he was not in office, his wife would call up and ask, “Where is your boss?” and I would say, “I think he's gone for a smoke.” After a while, he quit smoking. So you have to find ways of managing these situations. The other aspect we should not miss here is what Giridhar beautifully said. Hanuman is Vayu Putra (son of wind god) and he symbolises all of us in some way; he epitomises what we have to become. The mind can expand to any levels; it can also contract and find a way out. Similarly, a devotee's mind should also find its own potential of expansiveness when there's a need but before God it should become totally humble and small, and be able to reach the goal of merging with God. Both aspects are important. BP: That's a very beautiful insight. Just to add to what Giridhar was saying, I remember many instances just like the wine incident. There's one boy who was supposed to drink wine but he exchanged it for a Coke and no one realised it. For him, it is so natural because he is a product of this University. His colleagues could not fathom how come he doesn't do any of the things they did. They now respect him for who he is. At one point the company wanted to send a representative whom the client would definitely believe, and the client said, “If Sathya comes, we will not doubt what the company is offering.” So he became the representative of the company when it came to credibility. DA: That is why Swami says leadership role is important. When you are the leader of an army, it is always better to fight with an army of sheep with a lion as the leader than an army of lions with a sheep as the leader. Even in the Prasanthi Nilayam hostel, when any student comes he immediately starts developing the qualities of surrender, love, clarity and devotion to God. The culture of this place has made it happen – the leader sets the culture. 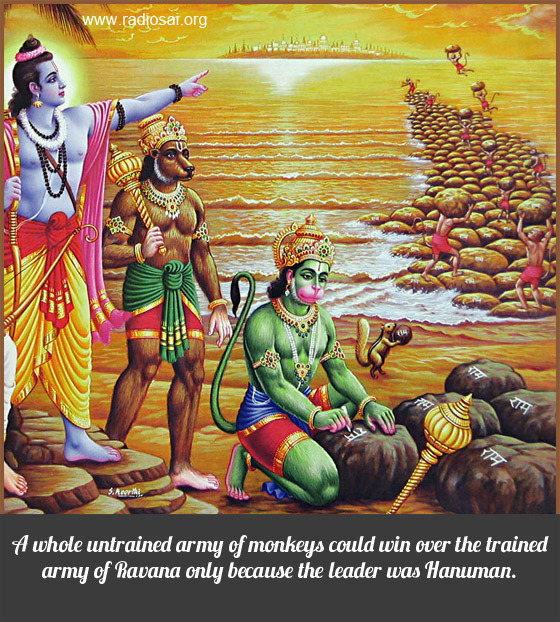 A whole untrained army of monkeys could win over the trained army of Ravana only because the leader was Hanuman. BP: Also we have instances in Ramayana where it was the right environment which enabled Hanuman to rediscover himself. For example, when Hanuman was asked to cross the ocean, Jambavan and all the other elders encouraged him saying, “Hanuman, you are the one with mighty strength...” They reminded him of all the feats he had done since his childhood, and this really filled him with courage. Talking about slumber let me move on to the third obstacle that Hanuman faced, which is Simhika or Chaaya Graahi. Chaaya Graahi means the one who had the power to drag the object by the shadow. As Hanuman was flying towards Lanka, the third challenge was this demoness who had the power to drag any flying object by its shadow on the sea. So she started pulling Hanuman down. But Hanuman simply gives one strong blow and the demoness dies. The significance of Chaaya Graahi is that it represents a tamasic obstacle. A tamasic obstacle means to see untruth as truth. Slothfulness, base desires, etc. are qualities of tamas or tamasic obstacles in a sadhaka's life. Swami says that the only way to overcome tamas is to completely beat them out. In fact, the shadow is very symbolic. The demoness had the power to pull the object through the shadow and here the shadow represents the past vasanas (tendencies), desires and emotions which we carry from so many births. All these pull down the spiritual progress of a sadhaka. Swami says that the way to overcome these tamasic quality or vasanas is to be determined and be strong and courageous. And Hanuman-like courage means having faith in the Lord knowing fully well that He the one who is driving us and working through us. These vasanas or tendencies cannot be negotiated like how it was done with the Mynaka Parvat. They cannot also be countered through intelligent means. In fact they will eat you up though counter-intelligence. Our minds are like that; we will come up with more intelligent ways. BP: Just to give an example, take the vasana of sleep or sloth. You have to get up at 5.30 in the morning and you negotiate saying, “It's okay. Let me just sleep for another 10 minutes.” One hour will be gone! Sometimes you try to use yukti — “You know what? Sleep is so important. The body heals itself the most when it takes rest... If I don't sleep now later in the day I'll feel sleepy. Better I take rest now” and so on. The mind works in various misleading, mysterious ways. As you rightly said, you cannot negotiate or use your intelligence. You just have to throw the vasana away.